Good equipment, miles, home time with a focus on our driver’s health and wellness. Technology + Communication = Unsurpassed On-Time Service. Eliminate the lost opportunities your business regularly deals with when you lack a reliable partner for interstate trucking. With prompt ground shipping options, your goods arrive on time. Enjoy the freedom of the open road when you become a part of our growing company. We offer employment opportunities with an honest approach that is free of recruiting gimmicks. 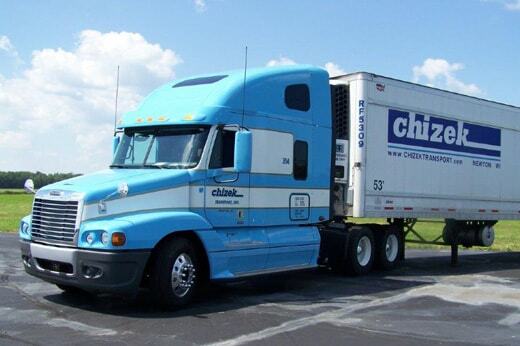 Chizek Transport, Inc. entered the transportation industry in 1962 when Carmen Chizek the founder of the company hauled agricultural products from the fields of Wisconsin. As the company grew through acquisitions and internal growth, other commodities were added. Our goal is to strive to not only meet and exceed a customer’s needs, but to also give them lasting value. We recognize that we have both external customers (those that purchase our services), and internal support (fellow associates whose work depends on the work that precedes them). Please take a moment to submit this rate quote form, and a staff member will return to you as soon as possible. You may also call us toll-free during regular business hours at the number listed below. © Chizek Transport, Inc 2019. PO Box 147 Cleveland, WI, 53015.